Since the mid-1980s a substantial body of research has taken shape on trade in services. Much of this is inspired by the WTO and regional trade agreements. However, an increasing number of papers focus on the impacts of unilateral services sector liberalization. 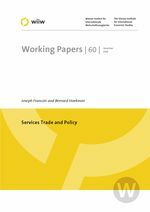 The literature touches on important linkages between trade and FDI in services and the general pattern of productivity growth and economic development. This paper surveys the literature on services trade, focusing on contributions that investigate the determinants of international trade and investment in services, the potential gains from greater trade, and efforts to cooperate to achieve such liberalization through trade agreements. There is increasing evidence that services liberalization is a major potential source of gains in economic performance, including productivity in manufacturing and the coordination of activities both between and within firms. The performance of service sectors, and thus services policies, may also be an important determinant of trade volumes, the distributional effects of trade, and overall patterns of economic growth and development. At the same time, services trade is also a source of increasing political unease about the impacts of globalization on labour markets, linked to worries about offshoring and the potential pressure this places on wages in high income countries.